1 of 5 Heat oven to 400 degrees F. Coat bottom of roasting pan with nonstick cooking spray. 2 of 5 In a small bowl, stir together 1 tablespoon of the olive oil, mustard, garlic, lime juice and zest. 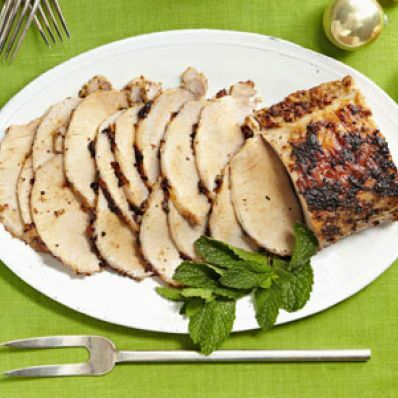 Place pork roast in prepared roasting pan and rub mustard mixture over top and sides. Season with salt and pepper. Roast at 400 degrees F for 60 to 65 minutes or until internal temperature registers 150 degrees F on an instant-read thermometer. 3 of 5 In a small nonstick skillet, heat remaining tablespoon olive oil over medium heat. Add onion and cook 3 minutes; stir in chile powder and cook 30 seconds. Add preserves and simmer until melted, stirring occasionally. Add vinegar and remove from heat. Stir in mint. Set aside. 4 of 5 Remove pork from oven; let stand 15 minutes before thinly slicing. 5 of 5 Serve sliced pork with cherry sauce at room temperature. Garnish with additional mint.